EDITOR’S NOTE: Each week, we feature intergenerational program ideas that were tried and successful. This series is a tool to highlight various age-optimized programs and practices. The program descriptions are provided by representatives of the programs. Inclusion in this series does not imply Generations United’s endorsement or recommendation, but rather encourages ideas to inspire other programs. This week’s cool idea is the Pinebelt Association for Families, a kinship care program that works with 75 families in southern Mississippi’s four counties. For the past fifteen years, The Pinebelt Association for Families (PAFF) has worked with families across the lifespan. Since its inception in 1999, PAFF has supported kinship families (grandparents and other relatives raising grandchildren) and now works with some 75 families in four counties in southern Mississippi (Covington, Forrest, Jones, and Smith). Services have been supported by monies from The National Family Caregiver Support Program administered through Area Agency on Aging of the Southern Mississippi Planning and Development District, United Way of Southeast Mississippi and private foundations. PAFF also serves largely homebound senior adults through our S.O.S. Program (Serving Our Seniors) providing home visiting, commodities, safety kits and available fresh fruits and vegetables. 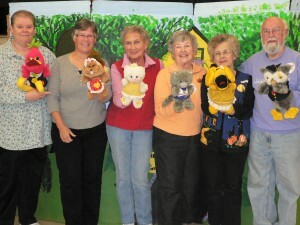 This week’s cool idea is RSVP BABES, a Beloit, WI-based program that uses colorful puppets to encourage children to live happy, healthy lives free from abuse. 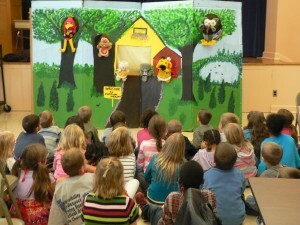 Trained RSVP volunteers using BABES (Beginning Alcohol and Addictions Basic Education Studies) puppets and a script present accurate, nonjudgmental and age-appropriate information to all second grade classes in Portage County. The program is designed to help children by promoting self-esteem, defining peer pressure and practicing good decision-making skills. The program also helps the children understand and develop skills necessary to cope with unhappy situations and stresses the importance of asking for help. In honor of World Poetry Day, we feature the intergenerational poetry program, Between the Lines. The program was started by Patti Russo, a certified poetry therapist from Carlisle, MA, a MetLife Foundation/Generations United 2015 Best Intergenerational Communities award winner. “Generations United opened my eyes to the field of intergenerational work and the many ways I can use poetry to bring generations together," said Russo, whose program works with Easter Seals, Pre-K and High Schools. In 2006, I was hired by Easter Seals to work on a grant they received from Generations United to explore how expressive therapies might bridge the intergenerational gap. I had previously used poetry with the bookend generations individually, but it had never occurred to me to work with them at the same time. About ten minutes into the first session I realized the power of this intergenerational work and instantly wanted to do more of it. in Carlisle, MA to promote poetry in the community. In addition to the benefits of poetry both generations experienced, the older adults profited from the kids' enthusiasm and energy and the children basked in the one-on-one attention they received from the adults. After that initial intergenerational experience funded by Generations United, I started offering intergenerational poetry groups at local preschools and high schools in the Carlisle area. It continues to be my most meaningful work as a poetry therapist. The exquisite corpse poem, "Six-word Memoirs," that high school students did with older adults. For more than 40 years, Joan Lombardi has made significant contributions as an international expert on child development and social policy. She was the founding chair of what’s now called the Alliance for Early Success (formerly the Birth to Five Policy Alliance) – a collaboration of state, national and funding partners that put vulnerable young children on a path to success. The Alliance was established by the Buffett Early Childhood Fund, where Lombardi served as advisor, offering support to states and other countries on early childhood. She also authored a book, Time to Care: Redesigning Child Care to Promote Education, Support Families, and Build Communities, in which she sites Generations United as the only national organization advocating for the mutual well-being of children, youth and older adults. Through a partnership with the World Forum Foundation, she launched the Global Leaders for Young Children program in 2004. The program has since provided leadership support to 19 early education leaders from eight countries. In spite of these efforts, Lombardi points out the haunting inequality among the nation’s youngest children and the overwhelming stress that families face every day without quality early education options. As national honorary co-chair of Generations United’s Seniors4Kids, Lombardi and her co-chair, Mary Catherine Bateson, charge older adults to support investments in quality early childhood. For Lombardi, supports at the federal, state and local levels include new public financing strategies that bring affordable quality early childhood services to families and attract the best teachers for the youngest children. 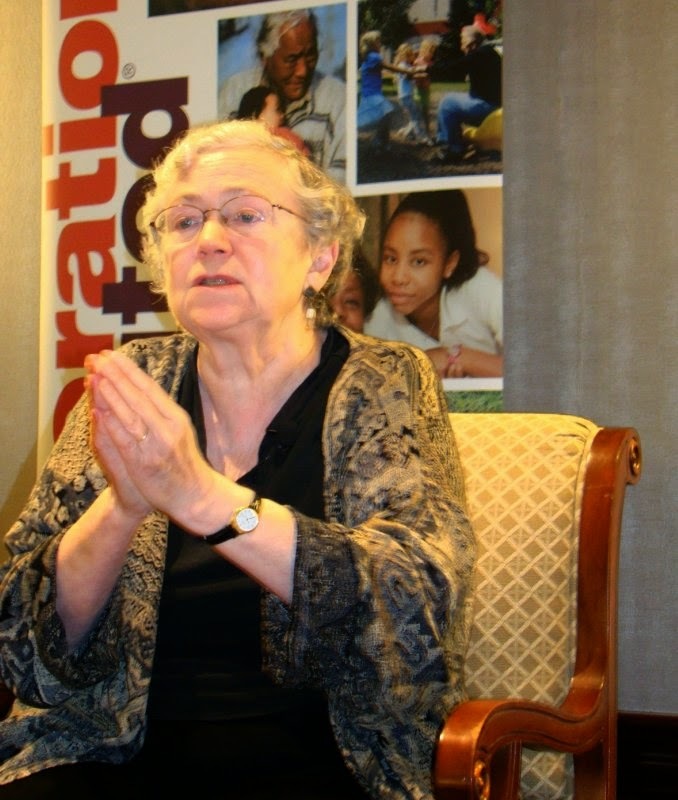 A writer, cultural anthropologist and scholar, Mary Catherine Bateson is a legend encouraging older adults to advocate for the future. Through her book Composing a Further Life: The Age of Active Wisdom (Knopf, 2010), Bateson celebrated the contributions and improvisations of engaged older adults. 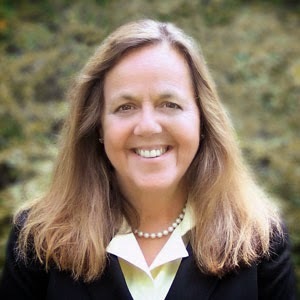 Bateson offered an opportunity in 2004, when she founded GrannyVoter, a non-partisan effort that helps grandparents share their voices, pool their power, and use their vote to advocate for their grandchildren. Today, that program is now merged with Generations United’s Seniors4Kids, of which Bateson is national honorary co-chair. Her book, Composing a Further Life, continues to lead to further exploration of intergenerational communication and changing ways of experiencing time. Through her Huffington Post blogs, which she often co-authors with her honorary co-chair, Joan Lombardi, Bateson uses election season, Grandparents Day and various campaigns to charge older adults to support investments in generations to come. Those long-lasting benefits include children becoming students who are 29 percent more likely to graduate from high school, according to The First Five Years Fund. Young people with quality early education become adults more likely to be employed and earn a 33 percent higher average salary. As a grandparent, Bateson sees it as a responsibility for her and other older adults to protect the future of children too young to vote. This week’s cool idea is Foster Kinship, a nonprofit that empowers kinship caregivers to provide the most stable and permanent placements for children in their home. When children can’t be with their parents, they should be with their family. Foster Kinship is a local nonprofit exclusively focused on serving kinship families and the over 19,000 children in kinship care in Nevada. To improve outcomes for children in kinship care, Foster Kinship empowers kinship caregivers to provide the safest, most stable and permanent placements for the children in their home. Foster Kinship provides three free programs for kinship caregivers: support, advocacy and case management. By helping to “keep home in the family” for these vulnerable children, Foster Kinship envisions a safe and healthy childhood for all children in kinship care. This week’s cool idea is The Kahuna Kupuna, an annual shortboard and longboard surf contest in Pacifica California that honors the more experienced (in age) surfers. While the main focus of the contest is the Kahuna Kupuna division for men and women 40 years of age and over, with separate sub-divisions for shortboard and longboard surfers, there is also an Intergenerational Team Division that welcomes surfers of all ages. Intergenerational teams are made up of six surfers representing three or more generations and must include at least one surfer under age 20. Got something cool you tried that was successful? Why not tweet your cool intergenerational ideas to #cooligideas? You can also post them to our Intergenerational Connections Facebook Group or just text us through the Facebook Messenger app (friend me to join our Cool Intergenerational Ideas group discussion). We want to highlight innovative age-optimized programs and practices through our blog, social media and weekly e-newsletter! Share the inspiration. In the latest of series, we feature the Central Oregon Council on Aging (COCOA), an intergenerational tech training for older adults based in Bend, OR. The COCOA developed and coordinates Teen Elder Computer Help (TECH), an intergenerational training class that teams teenagers with seniors to teach Facebook, digital camera download, cell phone and Skype. This program helps seniors stay in contact with friends and family during a time when communication is transitioning to social networking. Through this simple goal of connecting seniors to the social network, an exceptional intergenerational experience has developed for participating teenagers and seniors. Several seniors shared World War II stories and pictures with the teens, and teen teachers shared Facebook, Tumblr and Twitter knowledge with their senior students. This program has minimal administrative costs associated with coordinating volunteers and hosting a volunteer recognition event at the end of each session. Computer time and facilities are donated through senior centers, libraries, schools or laptop classes at the COCOA office. TECH’s goal is to reach 100 seniors each year at five sites and give 30 high school students an opportunity to experience teaching.